Some of my best memories are coming home from school and seeing that my Mom had made a cake. 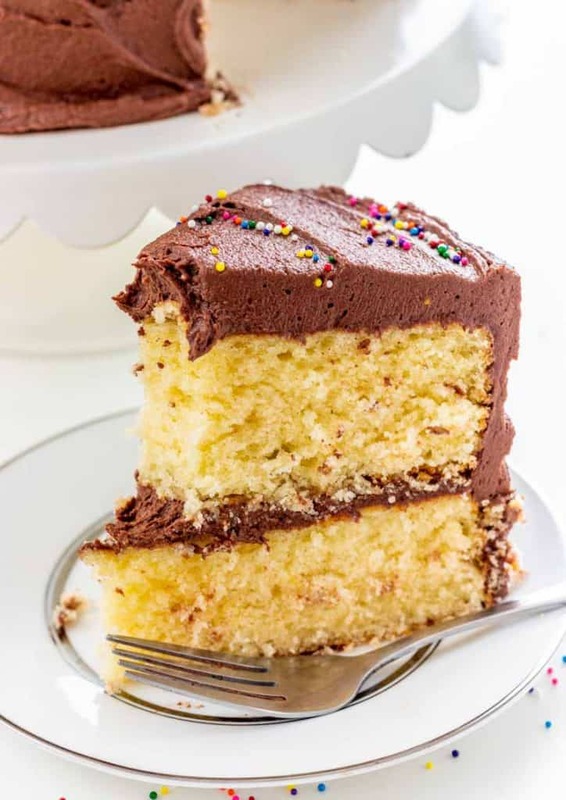 It was always the classic yellow cake with fudge frosting.Usually it was during the summer when we’d been playing outside or swimming all day. I don’t know about you, but swimming always made me insanely hungry. So when I’d get home and see that cake on the counter…well let’s just say it didn’t last til the end of the day. 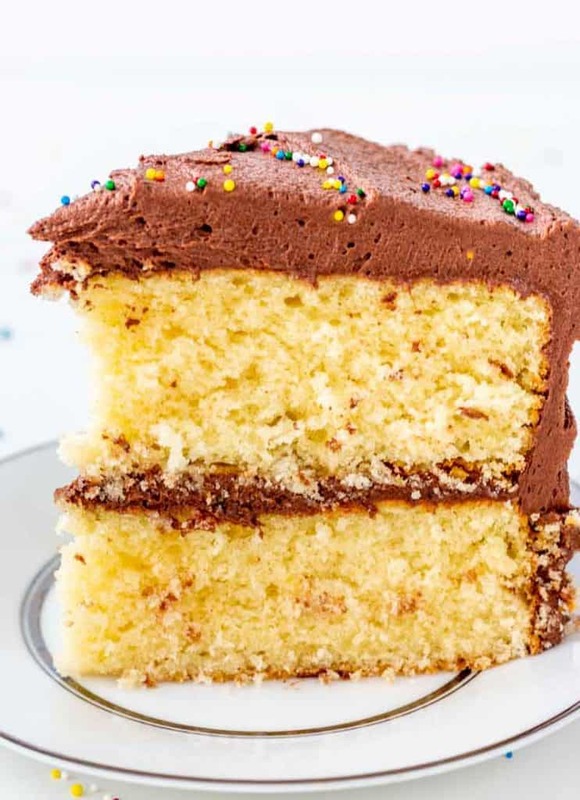 Now my mom was an excellent cook, but as far as cakes go, she usually just used a box cake mix. Hey, I was totally okay with that, since she made her fudge frosting from scratch. And when your Mom makes something for you, it’s made with love and that just makes everything taste good, right? 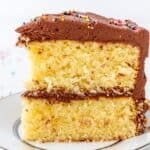 This cake recipe does use cake flour. Theoretically you can use all purpose flour with a few changes. 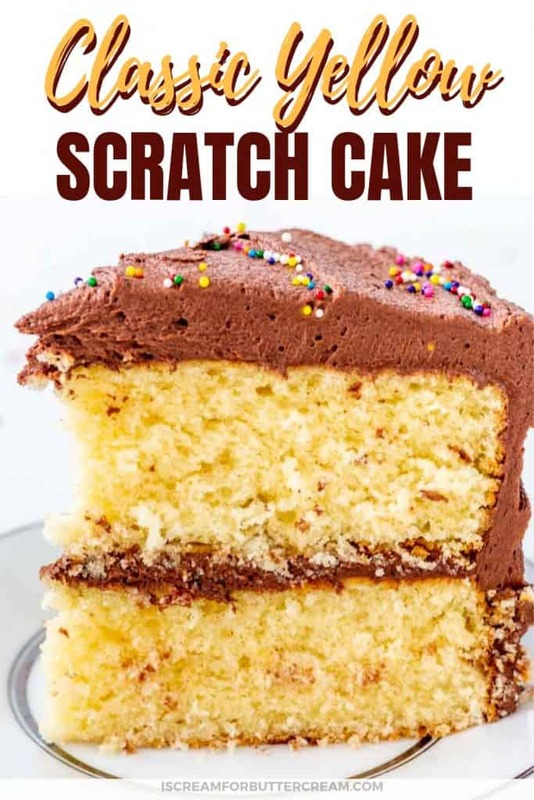 You can go to this link to get some common substitutions: Printable Baking Measurement & Substitution Cheat Sheet Post I really like using the cake flour though because it really makes a difference in the cake texture…it just makes it very delicate and soft, so if you can get it, use cake flour for this one. The next ingredient you’ll want to know about is buttermilk. If you don’t have buttermilk, you can always substitute that if you need to. You can find that sub on the link above as well. I would really like to twist your arm though about using full fat buttermilk. 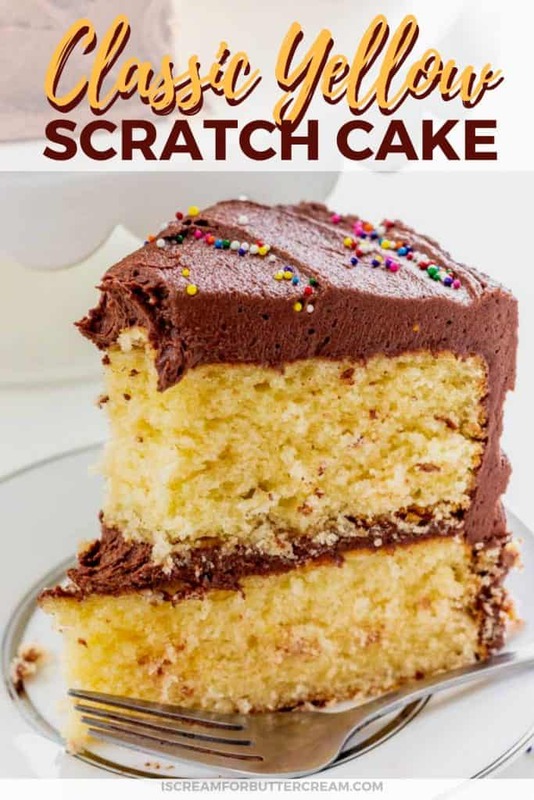 It really adds flavor and a lot of moisture to the cake. 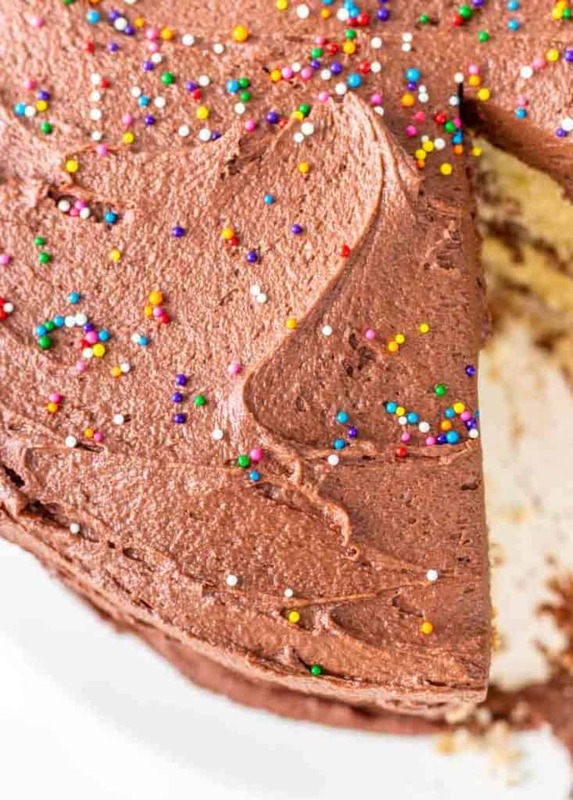 No, you don’t have to drink it….ewwww….but putting it in your cake makes it so delicious. 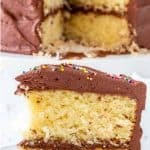 Okay once that deliciously delicate cake is baked, you’ll want to cover the whole thing in creamy fudge frosting. 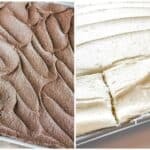 The recipe for the fudge frosting will make a lot. I do NOT like to skimp on frosting…no way. I want to make sure I’ve got plenty for the filling, the top and the sides. 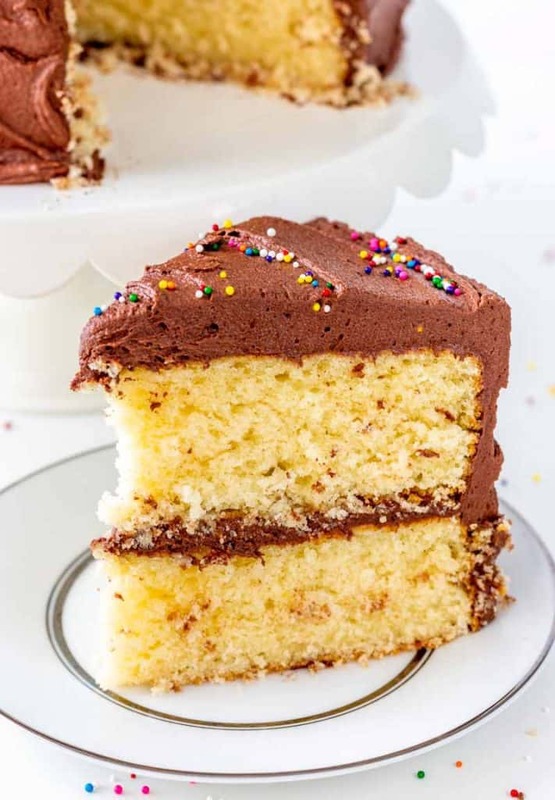 You’ll have a nice thick layer on your cake and you might have some extra to sneak off to your bedroom and enjoy all by yourself. Oh and if you really want to feel like a kid again, add some sprinkles! 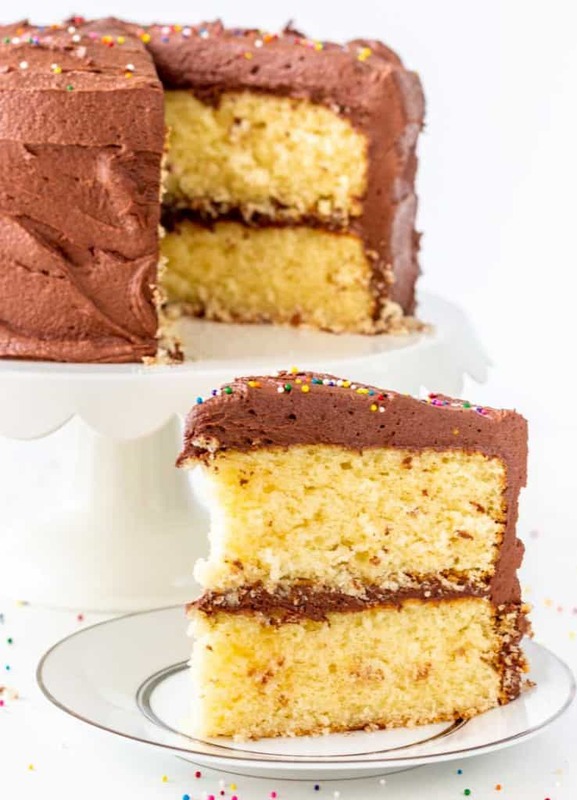 This classic yellow cake with fudge frosting is like taking a page out of your childhood. 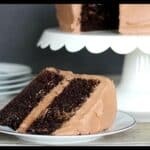 The cake is rich, tender and delicate, then it’s topped with a ton of creamy fudge frosting. Add sprinkles for fun! 1 cup butter room temp. In a bowl, add the cake flour, baking powder, baking soda and salt. Whisk and set aside. In another bowl, add the buttermilk, oil and vanilla. Whisk well and set aside. In a large mixing bowl, beat the butter and sugar with an electric mixer set on medium/high for several minutes until light and fluffy. Add in the whole eggs, one at a time, mixing on medium just until combined after each addition. Then add in the egg yolks and mix on medium just until combined. Now you will alternate adding in your dry and liquid mixtures. Add in a third of the dry mixture and mix on medium just until combined. Add in half of the liquid mixture and mix on medium just until combined. Add in another third of the dry mixture and mix on medium just until combined. Add in the other half of the liquid and mix on medium just until combined, then finally the last third of the flour mixture and mix only until combined. Scrape down the sides of the bowl and mix again on medium just for about 10 seconds. Be really careful not to over-mix your batter. Pour into two greased and floured 8″ round pans and spread evenly. You can test with a toothpick. There should be some light crumbs on the toothpick, but nothing liquid. Cool cake layers in their pans, on a cooling rack, for about 15 minutes. Then turn out of the pans and directly onto the racks and cool completely before adding fudge frosting. Melt the butter in a saucepan on low to medium. Add in the cocoa and stir over low/medium heat for a couple minutes and mix with a whisk to make sure all the chunks are gone. You don’t need to boil it. Just melt it all together on low. Take off heat and stir in vanilla extract and corn syrup. Let sit for about 10 minutes to cool. Transfer to a mixing bowl and add in three cups of the confectioner’s sugar. Add in several tablespoons of milk or cream and mix well with an electric mixer on medium. Add in the other three cups of confectioner’s sugar and mix well on medium. Check your consistency. If it’s too thick, add in milk a tablespoon at a time, mixing after each addition to get it to a smooth consistency. Optional: Add some colorful sprinkles for fun. 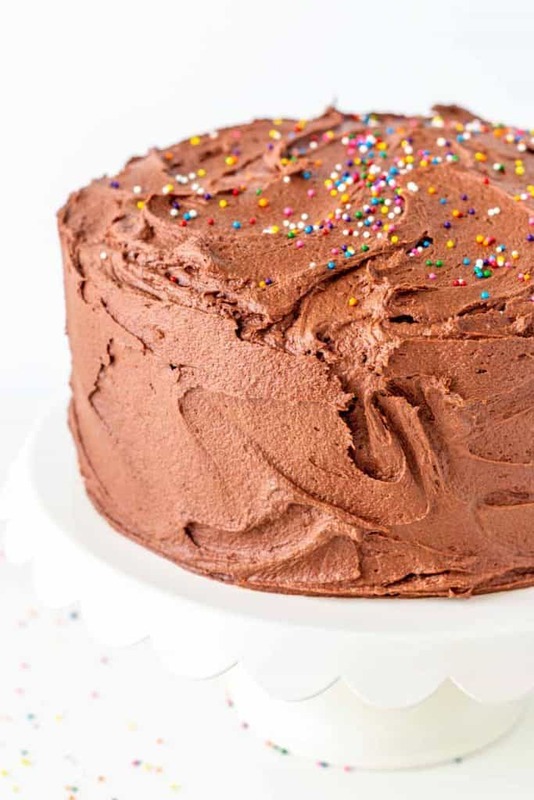 Notes: This cake does not need to be kept refrigerated unless you use a different icing that is perishable. It can remain covered, at room temp for a couple of days. After that, you may wish to keep in the fridge to help it last longer. 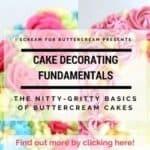 The buttercream makes plenty to cover a two layer, 8″ cake, or a 13 x 9 inch cake. I hope you like this one and I hope it reminds you of your childhood as much as it reminds me of mine. Hi! 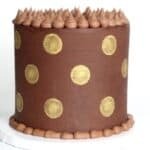 Any idea how I can make this for 3 8×2 cake pans instead of 2? Hi there! Yes, you can make a recipe and a half and it should be the perfect amount.